Limited edition (240 pp.) of 70 copies (50 being for sale): leatherbound, numbered and individually signed. The book includes a 16-page insert which includes cartoons of the Demon, the Spofforth and Murdoch paintings at the Sydney Cricket Ground Museum, Spofforth memorabilia at the Melbourne Cricket Club, Spofforth’s career at this club, the Spofforth sculpture at the Sydney Cricket Ground and images and memorabilia inspired by the Ashes debate of 1882 and 1883. 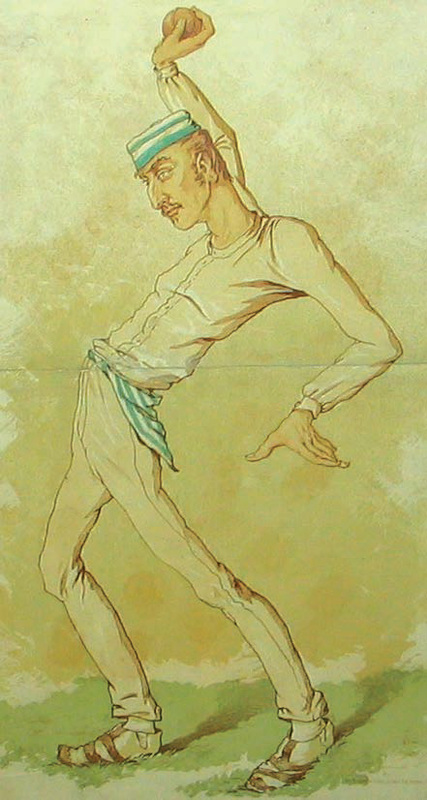 Spofforth, who came at batsmen ‘all arms, legs and nose’ was depicted as a contortionist by one 1878 cartoonist (Melbourne Cricket Club). 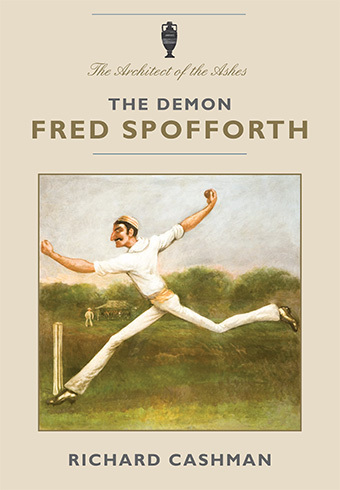 Since the first edition of this book in 1990, accolades have continued to be showered on the Demon Fred Spofforth. Much new information and many images have also come to light, partly due to digitisation but also because of the subsequent publication of biographies of other leading pre-1914 Australian bowlers. These works raise new questions as to whether Spofforth’s lofty standing as an innovative and influential fast bowler is warranted. Spofforth’s reputation is secure however, because he helped make international cricket popular, being the architect of the Ashes and taking the first Test hat-trick. He was the archetypal big-time performer who helped Australia develop a winning cricket culture. The many cartoons of Spofforth also suggest that he reached deeper into popular culture than any other cricketer of his time, thereby promoting the popularity of the game at a crucial point in its history. ‘Richard Cashman captures this evolution beautifully in this latest Spofforth treatise’ (Geoff Lawson OAM, Foreword). Richard Cashman has had an involvement in ten cricket publications, two of which won the Literary Award of the Australian Cricket Society. As the manager of Walla Walla Press he has published a number of cricket works including biographies of Jack Marsh and Tibby Cotter. He has also written many books on Australian sports and Olympic history, including a history of Australian sport entitled Paradise of Sport. From the late 1980s he was secretary, and is a Life Member, of the Marrickville-Pagewood Cricket Club and has played cricket for the University of New South Wales. He is an Adjunct Professor at the University of Technology, Sydney. (as sole author and in collaboration with other authors) (with Warwick Franks, Jim Maxwell, Erica Sainsbury, Brian Stoddart, Amanda Weaver and Ray Webster), The A–Z of Australian Cricketers. Australian Cricket Crowds: The Attendance Cycle: Daily Figures 1877–1984. *’Ave a Go, Yer Mug! Australian Cricket Crowds from Larrikin to Ocker. (with Stephen Gibbs), Early Cricket in Sydney, 1803 to 1856 (by Jas Scott). (with Max Bonnell and James Rodgers), Making the Grade: 100 Years of Grade Cricket in Sydney 1893/94 to 1993/94. Patrons, Players and the Crowd: The Phenomenon of Indian Cricket. (with Warwick Franks, Jim Maxwell, Erica Sainsbury, Brian Stoddart, Amanda Weaver and Ray Webster), The Oxford Companion to Australian Cricket. The Red and Blue Wickies: 50 Years of the Randwick CYM Cricket Club. (with Amanda Weaver) Wicket Women: Cricket & Women in Australia.